In early 2006, when Beacon Hospital in Sandyford, Co Dublin was approaching the final stage of its completion, it found itself left with a space at mezzanine level that was lacking in something. That something, the hospital felt, was a piece of art, and it set about looking for an artist who would do it justice. The hospital was keen to assert its corporate responsibility by including young, up-and-coming artists, so when it came across Irish sculptor Alva Gallagher, it commissioned her to fill the space. After much research into patient needs, Alva decided to create ‘Life Protected’, an oyster cradled in a bronze shell, which would symbolise protection and growth. The piece fit in perfectly with what Beacon Hospital was trying to create. Gallagher’s work is generally based around water, having grown up in Killybegs in Donegal and diving from a young age. “I’m a water lily,” she jokes. “I love getting the chaos of the water in, and in my pieces I use bronze and glass. Glass has that transparency and gets the order of the chaos.” While the oyster is an extension of that love of water, it has brought a calmness to the Beacon Hospital, showing Gallagher’s ability to fit the brief. Kavanagh has much praise for Gallagher’s work ethic. Since leaving college, the sculptor has thrown herself into her art, and works long hours. She has had work exhibited in China, Paris and Denmark, and has a number of pieces in private collections, in the National Museum of Ireland, Dundrum Town Centre and the BMW corporate collection among others. Of Gallagher’s work with Beacon Hospital, Kavanagh says: “She did a lot of research into patient requirements, use of appropriate local materials and logistics of placement, which we found admirable for someone so young and with minimal corporate experience. 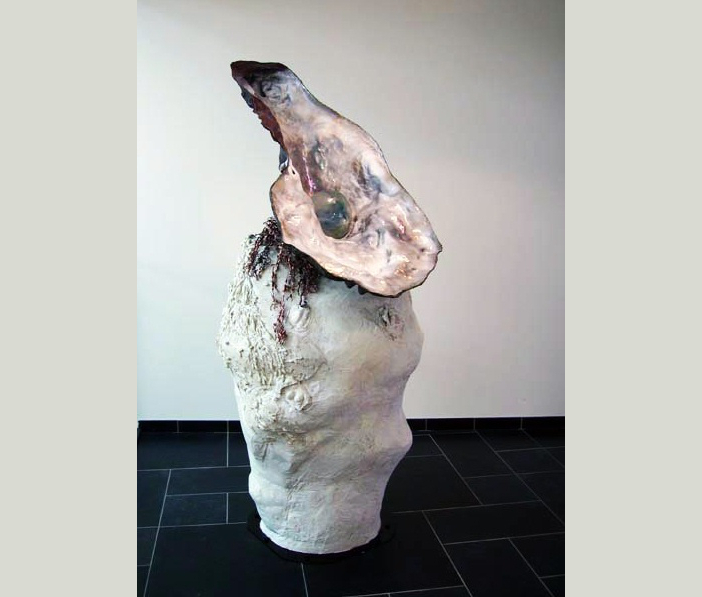 After more than a year’s work and much flexibility from Gallagher, the finished piece was taken from her studio in Longford and presented to the Dublin hospital in August 2007. “As a contemporary piece, we always hoped it would be thought provoking and contemplative for patients and visitors alike. This has proved to be an understatement, as the sheer scale and ingenuity of the piece stops people in their tracks. The idea of using the ‘pearl’ as a precious, coveted entity, injects a warm atmosphere into our sleek, light filled building,” says Kavanagh. Gallagher’s “thoughtful and consummately professional” approach will no doubt earn her repeat work and new commissions. She’s certainly gained an admirer in the Beacon Medical Group, which says it hopes to work with her again.